Pyli is a small town of about 2500 inhabitants of the island of Kos in the Dodecanese . Pyli village is mainly agricultural: the kingdom of the tomato. The ancient city of Pyli (Greek: Παλιό Πύλι) was the capital of the island of Kos in the Byzantine era . 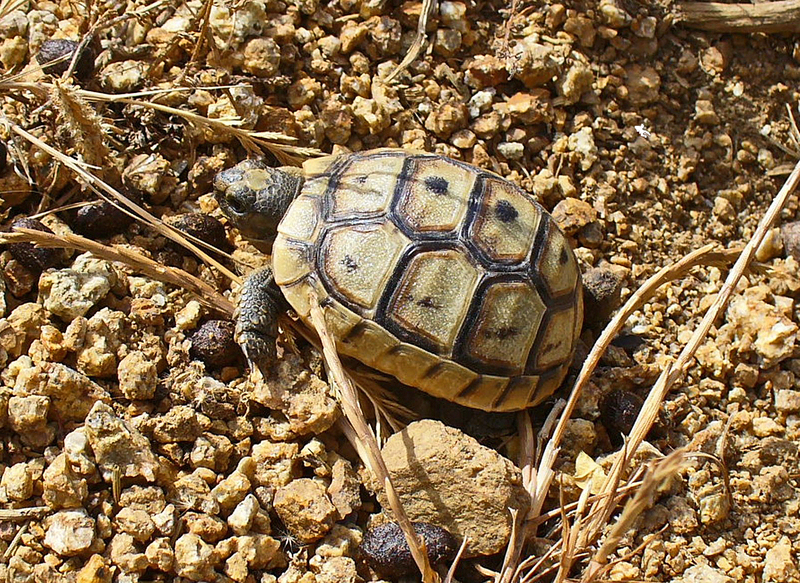 Pyli (Greek: Πυλί) was once called "Peli". Pyli is located in the center of the island of Kos , 17 km west of the capital Kos . From the main road from Kos, we must turn to the left a small road that climbs toward the mountain. 2 km before reaching Pyli, there is a small pond near Linopotis, which is used to irrigate crops in the plains. At about 3-4 km south-east are the ruins of Paleo Pyli . You can also reach Pyli since Asfendiou , a small road through the countryside to Lagoudi and continues to Amaniou, where there is a branch to Paleo Pyli. Since Pyli, you can go by bus to Marmari , about 4 km south, which has a wide sandy beach very enjoyable. Pyli in the middle of a large grassy plain planted with olive trees around its beautiful central throng traditional houses of stone and a few tavernas. "House of Pyli" (Pyliotiko Spiti) is a small museum that features a traditional house Pyli as its owners have left it a little more than 70 years. The old house has three rooms: kitchen, living room and bedroom with original furnishings. A hundred yards from the house-museum is the famous water source Pyli. The fountain fed by the source is a square building with a flat roof, which dates from the time of Ottoman occupation (1592), the water flows from the fountain of six nozzles. The water source is fed by Pyli channels to neighboring land, the source also supplies drinking water to the towns on the island, especially the town of Kardamena . 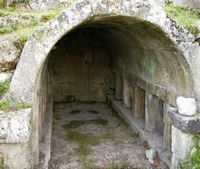 Beside the source Pyli, and not far from the hamlet of Amaniou, is the tomb of Charmylos (Χαρμύλος), son of Chairylos, who was a legendary hero and king of Kos in antiquity. 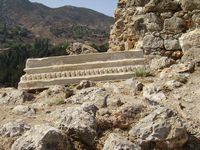 The tomb is marked as "Charmylos Heroon" a heroon being in ancient Greece, a monument erected over the grave of a hero. The monument, called Charmyleion, date from the late fourth century or beginning of the third century BC. The building is surrounded by a fence. The tomb is a monument rectangular, covered with a barrel vault, with, in each side wall, six niches that were filled with large stones: these twelve arched niches are the graves of Charmylos, his family and descendants. The front of the monument was covered with white marble, a fragment of which is in the Church of the Holy Cross was built over the grave. On the facade of the church, an inscription indicates that the memorial is dedicated to Charmylos and twelve gods of Olympus. The Church of the Holy Cross (Σταύρος) was built over the tomb of Charmylos, using lots of marble taken from the monument. It is a medieval church with a single nave, its front has two blocks of sandstone with a cross in early Christian relief. The ruins of the medieval town of Pyli the old Pyli (Palaio Pyli,Παλαιό Πυλί), is located 3 km southeast of the city of new Pyli that can be seen below, the ancient city of Paleo Pyli lies on the western slope of Mount Dikeos , at an altitude of about 300 meters. You can also reach Paleo Pyli coming to Asfendiou and Zia : Zia exiting, turn left and follow the signs for Pyli, just before the village of Pyli a road on the left leads to the extensive ruins of the medieval village; well-marked path leads beyond the remains of houses and up to the castle perched atop boulders. Paleo Pyli was the capital of the island of Kos in the Byzantine Empire . It remains meager ruins including the remains of the village and castle ruins Peripatos, three chapels, frescoes fragments which remain, are being restored, the oldest dating from the eleventh century. The village was abandoned in 1830 following an outbreak of cholera. 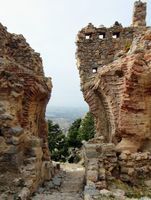 Castle Peripatos to Pyli began to be erected at the end of the eleventh century (1093), in the Byzantine era, the reign of the Macedonian dynasty of the Byzantine Empire, who ruled from the ninth to the eleventh century. 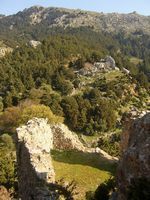 The castle was built in the northwest of the monastery Sainte-Marie had founded Latrinos Christodoulos, but after the departure of Christodoulos for Patmos. The fortress was built in order to fortify the island against attacks by pirates and Turks, and to be able to control the coast of Asia Minor. When the island of Kos was conquered by the Knights Hospitaller of St. John in the early fourteenth century, the castle was restored and strengthened to ensure the defense of the region. In the building structure, we recognize the influence of the Knights of St. John : the fortress has three speakers, external enclosure is rectangular. Peripatos became one of the key fortresses of the Order of St. John Kos. The main door - in the southern part of the castle - still exists and is accessible by a flight of stone, but the seven towers of the outer wall of the castle lay in ruins. Inside the fortress, two tanks were used to collect rainwater, you can still see them. Access to the castle in 15 minutes, a path to the left of a source where the paved road ends. 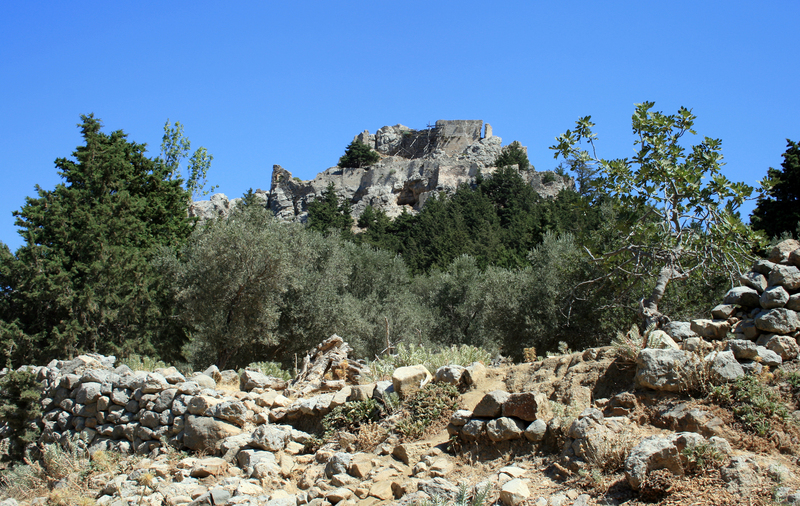 The castle Paleo Pyli offers an exceptional panorama on the northern slope of Mount Oromedon and on the north coast of the island of Kos, with Marmari and saltmarsh Alykes , then off the islands of Kalymnos and Pserimos, and the west coast of Asia Minor, which is on the horizon, with the Bodrum peninsula . The Monastery of Sainte-Marie Kastrianon was founded in the eleventh century on the hill to Kastrianon Pyli by the monk, founder of several monasteries, Christodoulos Latrinos(Χριστόδουλος Λατρηνό) when, having left Strovilo in Asia Minor, he came to Kos in 1082 . The monk - who will be beatified - Kos then left to found the monastery in Patmos St. John the Evangelist (1088). The monastery church was dedicated to St. Mary, but today is dedicated to Our Lady of the Presentation (Panagia Ypapanti,Παναγία Υπαπαντή), the Presentation of Christ in the Temple. The Church of Panagia Ypapanti is a single-nave church, it retains vestiges of hagiographic murals of the fourteenth century, a wonderful wooden carved icon and ancient columns taken from the Greek temple of Demeter who was nearby. 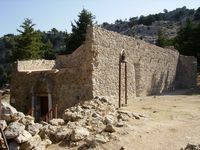 The church of Saint-Antoine (Agios Antonios) is located in the south-east of the village of Paleo Pyli. This medieval church dates back to the Knights of St. John. It is a church with a single nave, the roof of the church has a mural of the sixteenth century which represents a sermon of St. Anthony; tombs were discovered inside. The Church of the Holy Archangels is located south-west of the village of Paleo Pyli, three churches Paleo Pyli is the one that is in the lowest position. It is dedicated to Saints Archangels Michael and Gabriel. The eastern part of the main building dates from the Byzantine period, the church was enlarged westward during the period of the Knights, by adding a high room and a rectangular narthex was added later when a tomb was discovered . The church has two entrances on the west side and two rectangular windows. Outside the south, are the remains of a graceful arc of a Latin type usually seen on Rhodes or Cyprus. The church has frescoes Taxiarches fairly well preserved dating from the fourteenth to the sixteenth century, especially scenes from the life of Christ, including a beautiful "Betrayal of Christ by Judas" on the north arch. The temple of Demeter and her daughter Persephone was located in the plain area northeast of the hill in a place called Psoriari Kiparissi. The temple dated from the beginning of the fourth century BC, it formed part of the ancient city of Alention. The temple of Demeter was excavated in 1929, seven statues representing Demeter and her daughter Persephone were discovered, and a statue of Hades and the base of another statue, these pieces are exhibited at archaeological museum Kos . Each April 23, Pyli organized a horse race, with, as a prize, an Easter egg, the egg is then broken on the front of the winning horse, this custom dates back to antiquity. Is an interesting circuit to take the bus to Kos to Zia , and then to walk the path of Zia Pyli and can then return by bus from Kos Pyli.